After the church of St Sidwell’s got a direct hit during the Exeter Blitz of May 4th 1942 the surviving stained glass windows were removed, wrapped in cardboard and stored for safe keeping at St Matthew’s church in Newtown. Over the next few decades the contents and provenance of the stained glass panels was lost from public memory. It wasn’t until recently, that the glass panels were rediscovered, the connection made to St Sidwell’s and a decision was made to try and restore them. 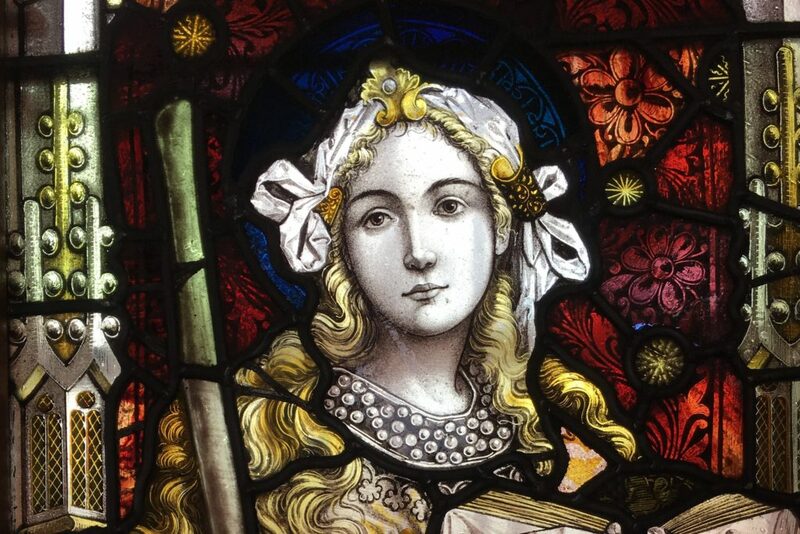 Some of the panels feature the legend of St Sidwella, Exeter’s little known patron saint and it was decided that the first panel to see the light of day again should be the beautiful depiction of St Sidwella. The restoration was carried out by Exeter glass restorer Andrew Johnson and put on display for the first time on St Sidwella day, August 2nd 2016. Read more from an ITV news item published in 2016.